The FPS is the gaming behemoth of the day. From Call of Duty to Battlefield, to a hundred other games and franchises that try to carve out their share of the massive FPS audience, it seems like the genre has defied any ideas of oversaturation. Multiplayer FPSes rule the roost, in every scene from esports to the casual gamer’s couch. However, on the way to the top, FPSes seem to have abandoned the need for a great single player component, in addition to the multiplayer. The single player FPS, it seems, has become all but an afterthought. And yet, it would be rather myopic to assume single player modes or campaigns in the FPS are not worth to paying attention to anymore. On the contrary, reintroducing great campaigns to the FPS can do much to revitalize the genre and offset the flood of mediocre games that try to cash in on the multiplayer obsession. Wolfenstein: The New Order is an example of a brave developer sticking to their guns, and focusing all their resources and energy into creating a stellar FPS campaign for those of us who like our games with a distinct personality. The action carried the same level of adrenaline-pumping mayhem that you might expect from a multiplayer experience, but with the added factor of an entertaining storyline and characters. Lasting over a dozen hours, the campaign offered diverse settings, uber-cool missions and utter destruction; no one missed multiplayer. And for a game that focused largely on delivering the feeling of being a one-man army, adding a mode that throws several other players with similar, or dumbed down powers, would be defeatist. In another vein, Bioshock Infinite is an example of a stunning masterpiece of an FPS campaign: combining the strengths of the genre such as the immersive point of view , with a world, characters and story that demands every ounce of your attention. To truly take in the beauty of the game, the attention to detail and understand its scope would simply be impossible in the frenetic pace of a multiplayer match. 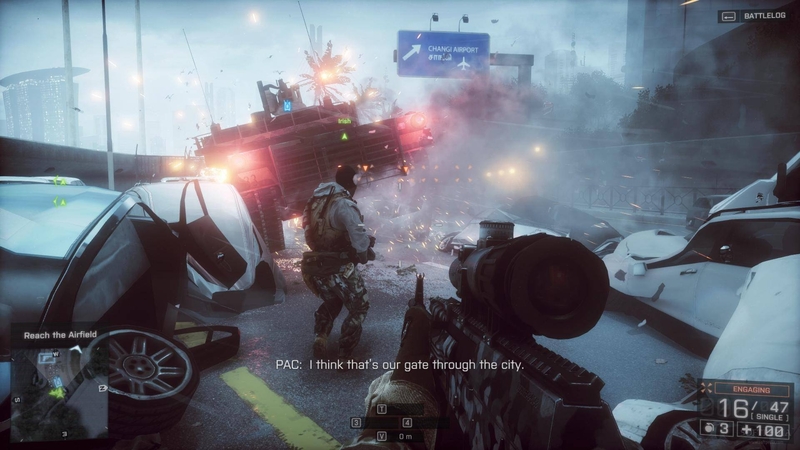 As an FPS, Infinite still focuses a significantly on the action, but having a deliberately paced storyline allows the player to pause and absorb the nuances of the game – something that would be wholly impossible in a multiplayer match. The genre isn’t, however, limited to an exclusively single player experience. Every big-name franchise out there has a campaign mode – some work well, others, not so much. Since the original Modern Warfare back in 2006, the focus on the multiplayer aspect has been on an exponential rise, while it seems, rather unfortunately, that the single player part of it is tacked on. Many gamers have taken to saying that rather than adding a half-assed campaign mode to a game, developers should skip it altogether, and stick to multiplayer. This might seem like a logical solution, but it’s forgetting one thing: campaigns in these games can still be a lot of fun. Take the case of the recent Battlefield games. They’re visually stunning – vast battlefields, crumbling cities, scenic warzones, all rendered photo-realistically. These settings, in the heat of battle, take on a new form altogether, and make for some epic set pieces. Whether it’s an attack helicopter strafing you, the ground around you rippling with bullets, massive tank battles or frenetic shootouts in urban centres, the directed flow of the campaign sets up some extremely memorable cinematic sequences. While the dynamism of a multiplayer battle has its own appeal, the choreographed chain of events that lead to fighter jets careening off the deck of a sinking aircraft carrier as you navigate the wreckage, is quite simply unmatched. The Modern Warfare series, although often maligned for contributing to the decline of the extended campaign, had epic, globetrotting storylines that are imprinted in the memories of a generation of gamers. The COD campaigns have gotten boxed-in since then, but denying its initial influence would be presumptuous. The future of the FPS campaign now lies with two parties: the onus on the players is to accept the changing face of the FPS campaign and invest in the several single player FPSes that are still coming out. Meanwhile, developers need to recognize that the audience for the campaign is still huge, and needs investment. Reworking the fundamentals isn’t necessary, but taking the elements of a successful mode and switching it up enough for two FPSes in the market to be distinguishable from each other would go a long way in revitalizing the genre as a whole. The FPS is here to stay; it is, by far, the most successful genre of gaming. Recognizing its strengths and applying them to the single player mode in creative ways would stave off the complain that it’s going stale. On a related note: maybe put out a Call of Duty once every two years instead?